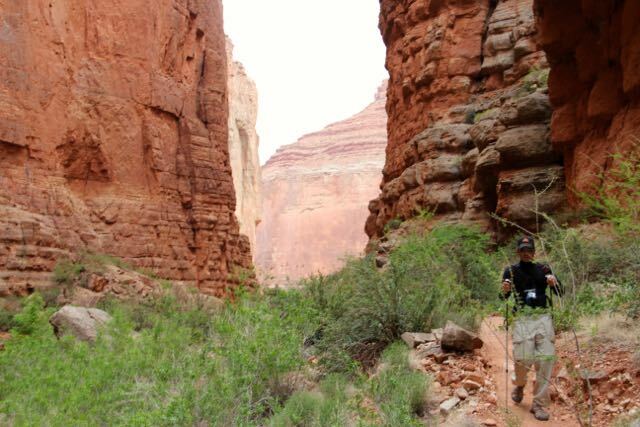 Side canyon hikes are guided as one will be leading the pack and another trailing. In most cases, you will hike to a particular destination where you will have time to relax and enjoy the scenery before heading back to the raft. At the discretion of your trip leader, you may be able to hike at camp as well however these are not always guided, and it is strongly recommended to hike with at least a partner. There may be a day or two where you may experience more Grand Canyon hikes or excursions than other days, as certain areas of the canyon offer a series of attractions all within a few river miles. Subsequently, there may be days with additional travel in order to stay on pace and make up the distance in river miles. There is nothing better than being able to partake in these off-raft adventures, and an essential part in maximizing your experience is being prepared and well hydrated.Being in good cardiovascular shape can increase your level of enjoyment on these side canyon hikes. As the canyon is extremely dry, you lose a great deal of moisture through simple perspiration and breathing. It is imperative that you carry water with you at all times, and drink at least 1/2 to 1 quart during hikes.Clothing can also play a big role in keeping you cool. While wicking material/dry-fit is designed to pull sweat away from the body, it is not always the best way to keep your body cool.During hikes on hot days, we recommend frequently dunking your 100% cotton t-shirt in the river as it will take longer to dry, hence keeping you cooler longer. In addition, close toe/hard sole shoes are recommended for the Grand Canyon hikes and you can find more information on a sample packing list here. As mentioned above, these hikes are elective. You are more than welcome to grab your book, find some shade and enjoy the scenery while the group is away on their excursion.